Whether you are an agency recruiter or corporate recruiter you’ll have an interest in not only hiring the best talent, but hiring talent that stays the course. An especially high-risk period for new hire failure is within the first two months as revealed by research from the Wynhurst Group, which shows that 22 percent of staff turnover occurs within the first 45 days of employment. One particularly challenging new starter scenario is when a new manager is hired to join a team, particularly when that team is resenting of the new managerial appointment for whatever reason, but usually because they are a newcomer, and therefore, an outsider. Below I have set out six tips for taking over a team that resents you, which recruiters might want to share with new managerial appointments. 1. Talk to the outgoing manager. Try and talk to the manager that is leaving the team. You may be fortunate enough to have some overlap time, but if not, you could arrange to talk to them before they leave or try to talk to them after they leave if you can get their contact details. You should be gathering intelligence that can help you to devise your opening strategy. For example, try and find out what’s important to the team, their values, what were the current goals, what challenges were they facing. This may be more difficult, but try and find out why the manager left. 2. Talk to your new boss. Another great source of intelligence about your new team will be your new boss. So, have your questions ready for them too. Of course, try and find out what your manager’s overall department objectives are and what role your team plays in meeting those objectives. Also, find out what worked and what didn’t work so well. Understand their priorities for change or improvement within the team. 3. Network and talk to peers. A research review paper by MITSloan Management Review shows that employees who quickly build informational networks with peers reach productivity quickly and are known as ‘rapid on-boarders’. The research also showed that new hires were particularly reluctant to approach senior staff members. So, to manage your new team effectively you’ll need to step out of your comfort zone and network intensely and find out who manages the departments that supply you, that deliver to you and who you may partner with. Talk to them and understand what keeps them up at night. Try and understand if they have had any difficulties with your team and understand if they would like to see any changes. 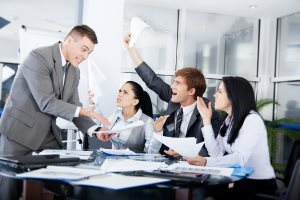 As you can see, successfully managing a new team that resents you is not just about dealing with the team, there are multiple stakeholders to deal with whose interests all need to be addressed in this critical period. Once you have this 360-degree view of the business, you can then begin devising your strategy to engage and focus the team correctly in line with overall business objectives. Look at each individual performance appraisal and a departmental or team breakdown of their employee engagement survey results, if these are available, to understand their personalities and issues. Then arrange one-to-ones with team members to hear their concerns and devise individual plans to move forwards. You may suspect that some team members are not up to the task, but it’s too early to decide that here. Give every employee a chance to prove themselves under your leadership, and don’t write any one off. Countless studies show (including this Classic AT&T study) that quick wins and early success can be a great way to galvanize and build spirit in a new team. So try and target some low hanging fruit/achievable outcomes that can be recognized and celebrated. There is no one right way to start out in a new team leadership role, but there are several best practices, which we have shown, that can help to set you on the path to success.